American Aero FTW's lobby was engineered with customer comfort in mind. It features self-tinting windows to shield the glare from the harsh Texas sun, and sound-proofing for a more relaxing environment. Above the CSR desk hangs a specially-commissioned sculpture, "Momentum" from New York artist Alyson Shotz. Dallas/Fort Worth's Meacham International Airport is one of the oldest airfields in the country, with more than nine decades of history. Today it is a dedicated general aviation airport, and the newest of its three FBOs is American Aero FTW, established in 2012. American Aero’s owners purchased an existing FBO, which was located in a crumbling 40,000-sq-ft hangar that once housed American Airways (later American Airlines) southwest headquarters. The company was determined to restore the 1933-vintage landmark structure and that building is now a separate storage hangar. As for the main FBO facility, when the city decided to renovate the airport’s former 1960s-era administration building, stripping it down to its girders, the FBO’s ownership decided to join in a public/private partnership, assisted in the reconstruction, and carved out an 8,400-sq-ft terminal on the ground floor of the building. The modernized facility debuted in 2016. 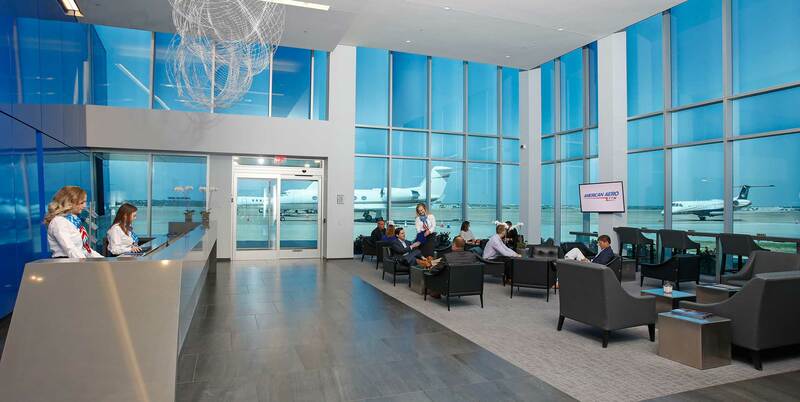 One of the FBO’s most striking features is its self-tinting, double pane windows. When an electrical charge is applied, the windows darken, shielding the vaulted lobby/passenger lounge from the harsh Texas sun. The effect is controlled automatically from a sensor on the roof, or the customer service staff can manually control individual window panels with a tablet. In addition to lessening the glare, the windows help keep the building cooler, allowing the company to save 20 to 25 percent on energy costs. While such an airy space could suffer from jarring echoes, the lobby was designed to maximize customer comfort. “Every surface where we had the opportunity, has some sort of sound damping material,” said Riggs Brown, the facility’s general manager, adding that speakers embedded in the walls issue white noise. The passenger lounge also features an extensive refreshment bar with fresh fruit, ice cream, nutrition bars, and a customer favorite, glass-bottled sodas. The CSR staff at the front desk will even sanitize your cell phone with a UV light device. The pilot’s lounge offers a large television viewing room, with recliners and a shower facility. The attention to soundproofing extends to the attached quiet room, which in this case, truly is quiet. The walls are double thickness, and the door separating it from the lounge weighs 1,200 pounds. The facility has a 20-seat, A/V-equipped conference room, while the crew galley, which offers real silverware and china, can double as a second meeting space. Laundry and dishwashing service is available, the latter in a 90-second dishwasher. American Aero is anticipating approval to join the DASSP program by the end of summer for direct flights into Washington’s Reagan National Airport. It has a separate secure waiting area with en-suite bathroom, direct ramp access, and its own snack bar. The terminal also offers a porte cochiere for loading and unloading customers (those who do not choose to drive directly to the aircraft), 80 covered parking spots, and four courtesy cars available for crews. A new U.S. Customs facility is being completed in the same building that houses the terminal, and it is expected to be operational by the end of the year. The FBO, a member of Signature Flight Support's Signature Select affiliate program, is normally open from 6 a.m. until 10 p.m., with after-hours callout available. It occupies a 29-acre footprint and has 250,000 sq ft of hangar space, which can accommodate the latest big business jets. Along with the historic and now fully-restored 40,000-sq-ft Hangar 11 North, the American Aero FBO added 100,000 sq ft of infrared-heated hangars that can withstand winds up to 120 mph. It is home to 30 business jets, ranging from a Falcon 900 to an Eclipse, and sees approximately 100 operations a week. The Avfuel-branded facility’s tank farm holds 44,000 gallons of Jet A and 12,000 gallons of avgas. It is tended by the NATA Safety 1st-trained line staff, which has also completed FlightSafety International’s Gulfstream ground handling and servicing course. As part of that safety consciousness, every member of the facility’s 22-person staff undertakes third-party CPR and first aid training, while three employees have received emergency medical responder training. The company also encourages its employees to contribute safety ideas. One that American Aero adopted is topping safety cones with solar-powered lights to post at each airplane’s wingtips at night.